WHAT CAN WE LEARN FROM THE HISTORY OF HEALTH REFORM IN THE UK? technology, but still finding time to be a formidable committee man. and Professor of Surgery at the Institute of Cancer Research. his astonishment however, asked him to be a Health Minister. above all, the patient experience. they performed, and not just how many patients they processed. stones when No 10 sent him on a 3am house call. do you decide where to go and what to do? been huge: "What he has done very effectively is change the mindset." stayed for a further year to steer the implementation of his reforms. Professor Lord Darzi is one of the world's leading surgeons and is a recognised authority in innovation in surgery, particularly in minimally invasive and robot-assisted surgery. Away from the operating theatre, he is also a leading political voice in healthcare and medicine. Born in Iraq to Armenian parents, Lord Darzi studied at the Royal College of Surgeons in Dublin before moving to the UK where he has lived and worked ever since. A brilliant surgeon, he joined Imperial College London and within four years was Chair of Surgery and Head of Department, the first of many senior appointments. Research led by Professor Darzi is directed towards achieving best surgical practice through both innovation in surgery and enhancing the safety and quality of healthcare. His contribution within these research fields has been outstanding, publishing over 600 peer-reviewed research papers. His internationally renown team lead science and engineering research covering areas including Medical Image Computing, biomedical engineering, clinical safety, and robotics and remote surgery. Appointed Parliamentary Under-Secretary of State at the Department of Health by Gordon Brown, Lord Darzi has also served as the UK Global Ambassador for Health and Life Sciences, and Chair of NHS Global as well as a UK Business Ambassador. He has also been appointed to the Privy Council. In recognition of his outstanding achievements in research and development of surgical technologies, Professor Darzi was elected as an Honorary Fellow of the Royal Academy of Engineering, and a Fellow of the Academy of Medical Sciences. He also holds Fellowships from institutions all over the world in surgery, medical sciences and engineering. Professor Darzi holds the Paul Hamlyn Chair of Surgery at Imperial College London where he is Head of the Division of Surgery. He is an Honorary Consultant Surgeon at Imperial College Hospital and holds the Chair of Surgery at the Institute of Cancer Research. He was recently appointed as Chairman for the Institute of Global Health Innovation at Imperial College. to be elected as a foreign associate of the Institute of Medicine,"
scientifically informed analysis and recommendations on health issues. the Institute of Medicine," said IOM President Harvey V. Fineberg. medical field. Their knowledge and skills will deeply enrich the IOM." research papers in these fields. was knighted for his services in medicine and surgery in 2002. Parliamentary Under-Secretary of State at the Department of Health. Armenia should work with diaspora Armenians, welcome them with open arms and make them feel their contributions matter because of intellectual wealth. We have abundance of people with immense knowledge and willing to give to their native land. Armenia shouldn't miss this chance because of shortsightedness. 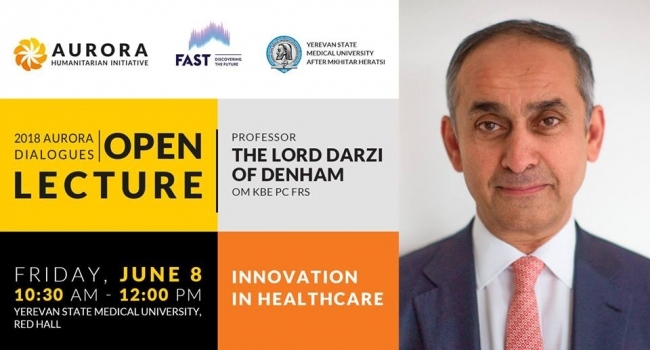 Lord Ara Darzi will deliver an open lecture, titled “Innovation in Healthcare”, at YSMU. Lord Darzi is a famous British-Armenian laparoscopic surgeon, member of the House of Lords of the United Kingdom, Director of Institute of Global Health Innovation at Imperial College London, and the former Parliamentary Under-Secretary of State in the Department of Health. Professor Darzi holds the Paul Hamlyn Chair of Surgery at Imperial College London, the Royal Marsden Hospital and the Institute of Cancer Research. He is Director of the Institute of Global Health Innovation at Imperial College London and Chair of Imperial College Health Partners. He is an Honorary Consultant Surgeon at Imperial College Hospital NHS Trust. Research led by Professor Darzi is directed towards achieving best surgical practice through innovation in surgery and enhancing patient safety and the quality of healthcare. His contribution within these research fields has been outstanding, publishing over 800 peer-reviewed research papers to date. In recognition of his achievements in the research and development of surgical technologies, Professor Darzi has been elected as an Honorary Fellow of the Royal Academy of Engineering; a Fellow of the Academy of Medical Sciences and in 2013 was elected as a Fellow of the Royal Society. He was knighted for his services in medicine and surgery in 2002. In 2007, he was introduced to the United Kingdom’s House of Lords as Professor the Lord Darzi of Denham and appointed Parliamentary Under-Secretary of State at the Department of Health. Upon relinquishing this role within central government in 2009, Professor Darzi sat as the United Kingdom’s Global Ambassador for Health and Life Sciences until March 2013. During this appointment and beyond Professor Darzi has developed his status as a leading voice in the field of global health policy and innovation. Professor Darzi was appointed and remains a member of Her Majesty’s Most Honourable Privy Council since June 2009. Edited by onjig, 31 May 2018 - 07:00 PM.